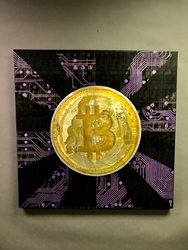 Former Master Counterfeiter Arthur J. Williams Jr Turned Famous Artist Gives Back To Kids And Other Charities At A Private Cryptocurrency Art Auction and Poker Tournament in Miami on January 20th and 21st. His Next Stop Is Tackling Parkinson's In Las Vegas With Muhammad Ali's Family and Research Center! Former Master Counterfeiter Arthur J. Williams Jr's story is Hollywood's Best Untold Gangster Story! Former Master Counterfeiter Arthur J. Williams Jr turned famous artist has pulled the ultimate American redemption story and now he is turning heads with his art and giving back in a big way to charities around the country! Artie for short, was the notorious Chicago gangster who produced an estimated $10 million dollars worth of the supposedly impossible to counterfeit 1996 hundred-dollar bills. He was later caught, sentenced and eventually did six and a half years in Federal Prison after he refused to give the Feds any information on any other parties related. While in prison the most interesting thing happened, Artie took an art class and even began to read books from the legendary master artists of the Renaissance like Leonardo Da Vinci and Michelangelo. His meticulous hardworking efforts along side his natural artistic talent ensured that he would surely be one of the greats as well! Artie's love for once printing money turned into a new love for painting money instead. After prison he went completely legit and is now producing extremely valuable art for celebrities and collectors all over the world. With the help of God and loved ones, Artie turned his life completely around and is now producing more art than ever to aid and assist those less fortunate.